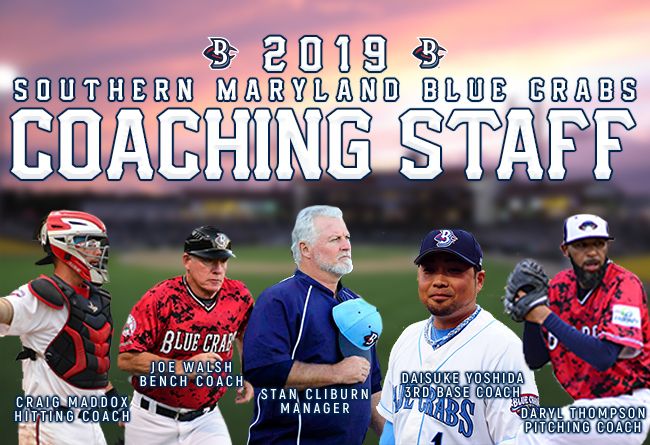 (Waldorf, Md., Jan. 17, 2019) – The Southern Maryland Blue Crabs announced the team’s coaching staff for the 2019 season today. Alongside Blue Crabs’ manager Stan Cliburn, who lead the Blue Crabs to a Freedom Division Championship during the 2015 season, the staff features returning Bench Coach, Joe Walsh, Third Base Coach, Daisuke Yoshida, Player/Hitting Coach Craig Maddox, and Player/Pitching Coach Daryl Thompson. Thompson needs no introduction, his name synonymous with the Blue Crabs. The Southern Maryland native is set to begin his 8th season with the Blue Crabs, and for the first time in his career will not only be a starting pitcher, but will also serve as the team’s pitching coach. His name will forever be associated with the Atlantic League as the fireballer sits top 10 in league history in innings, wins, and strikeouts. Thompson appeared in the MLB in two seasons, 2008 and 2011. The Blue Crabs play 140 regular season games in the Atlantic League of Professional Baseball Clubs. The Blue Crabs call Regency Furniture Stadium in Waldorf, Maryland home. The 12th franchise season will begin April 2019. For more information on the SOMD Blue Crabs, please call 301-638-9788 or visit http://www.somdbluecrabs.com for more information.